Whatever can be said about the financial crises that have plagued East Asian countries since the early 1990s, it must be averred that they teach us a great deal. Many earlier assumptions about finance and investment have been called into question, and the field is more open than it has been in many decades to legal and economic analysis and theory. In particular, issues of financial sector reform have come into sharp focus. Here is a new proposal, solidly grounded in current reality, for a regional "zone of law" designed to supplement and benefit domestic reforms under way in Japan and the three emerging economies of Indonesia, South Korea, and Thailand. The author draws on a wide range of relevant material, including exploration of international standards and "best practices" in banking and finance, the experience of the U.S. and the U.K. in planning and implementing reform measures, and the theoretical literature respecting financial crises and what causes them. In this context, the specific reforms applied in the four Asian countries under consideration are discussed in detail, with "lessons to be learned" about crisis detection, containment, and prevention. During the course of the analysis, the author reveals fundamental policy areas where meaningful and effective reform can take place. 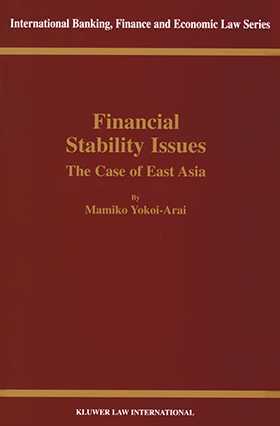 Financial Stability Issues: The Case of East Asia offers numerous practical applications at the same time as it strikes a rich vein of theory in the field. Its fresh, sensible approach will be greatly appreciated, not only by academic theorists, but by hardheaded business people, policymakers, and regulators as well.